Emmet the elephant is late for a trip and needs your help packing. 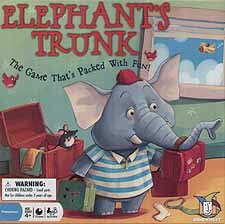 Take turns rolling the die and placing a piece of clothing into the matching coloured trunk But watch out for the sneaky mouse who will try to dump out everything you just packed. Be the first to pack up all of Emmet's clothes and he might just take you with him on vacation.